The eighteenth century was a tumultuous time that caused great upheavals in societies, cultures and governments around the world. The century began with a conflict that would span more than a decade to determine who would rule Spain in the War of Spanish Succession. The most powerful countries in the world fought each other across multiple continents for supremacy during the Seven Years War. Philosophers gained prominence and their thinking helped to topple monarchies across Europe. 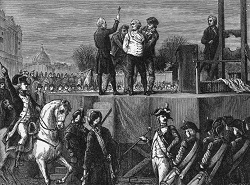 The American and French revolutions forever changed the way governments would interact with their people. The Industrial Revolution was beginning in several countries toward the latter part of the century. We are always excited to hear from other people that are interested in the eighteenth century. If you have a famous quote from the period or if you have something to share or have feedback on our site you can reach us at the email address below.